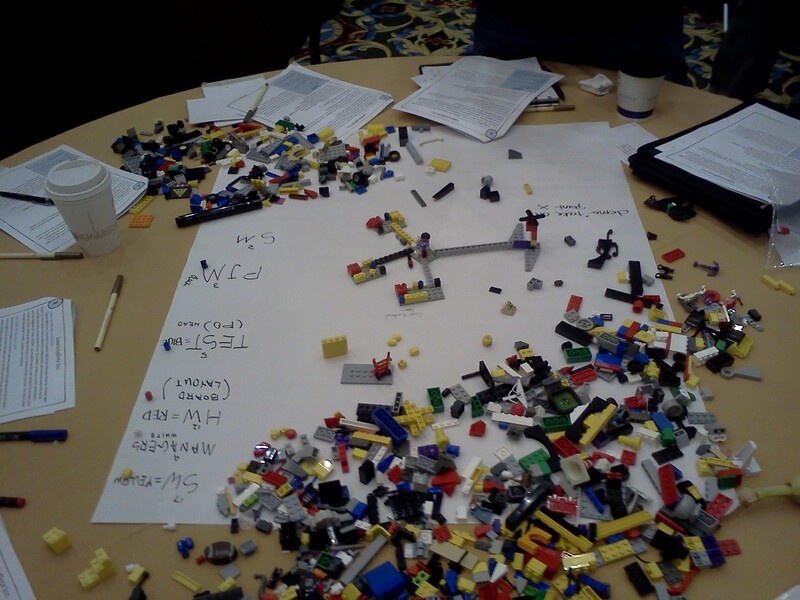 Last year, Agile2011 was 5 action packed days and it’s looking like more of the same for Agile2012! After a late flight in last night and a solid 4 hours sleep (I had a late start from Calgary and an extra hour layover in Denver so I didn’t get into my room until about 2:15am), we’re off to a great start with today’s sessions. LEtGO Your Organization – Design a Best-fit Large Agile Organization. In the morning session it was Catherine Louis and Raj Mudhar with their highly interactive LEtGO Your Organization – Design a Best-fit Large Agile Organization. Catherine is a friend of mine and I met Raj at the conference last year. Both are experienced agilists that have worked with large organizations. Both also have seen the hardware and software sides that go into a successful product so this was a session I knew I’d want to see. For a couple of different scenarios, people in the session were split into teams at each table. 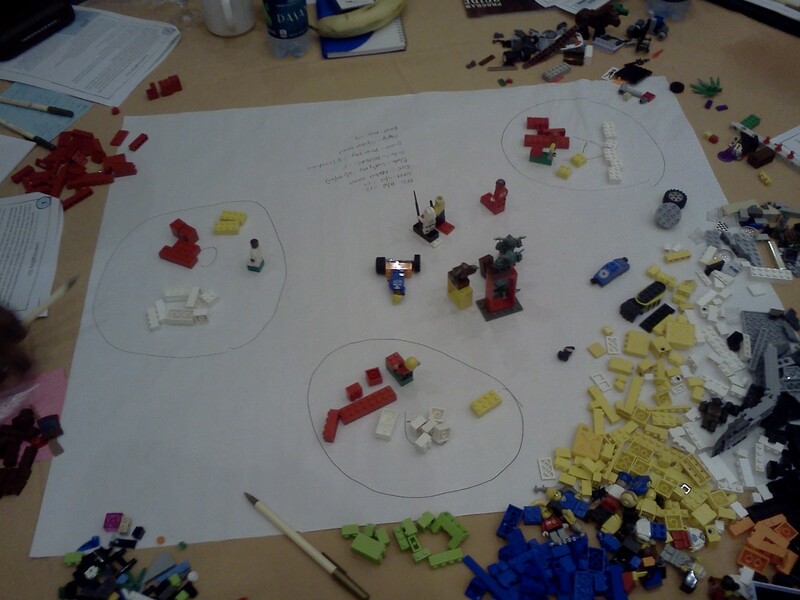 Each table had a bag or 2 of Lego that they’d use to model org structure. Different coloured pieces meant different functions in a software organization. How you bunched together or spaced out the pieces suggested cross-functional teamwork. Groups built structures like bridges to suggest close cooperation and communication, fastened Lego people to wheels to show mobility of a particular area of expertise and used positioning and height of a particular piece to show hierarchy. Groups debated how functional and product responsibilities affect each other, how responsibilities can change within an agile team, how to best form cross-functional teams and how hierarchy affects teamwork and communication. It made for lively discussion, a great session and a great way to kick off the conference. The afternoon session was awesome. The Agile Inception Deck was presented by Jonathan Rasmusson who is (or was??) a fellow Calgarian. (As an aside, Jonathan has another talk tomorrow morning at the conference, Agile in A Nutshell, which I’d seen a few years ago at a Calgary APLN gathering. That talk was pretty much my introduction to agile and one that I’d highly recommend for agile newcomers. It was one of the little pushes that got me looking at agile in the first place.) As the title suggests, this session was all about identifying the simple straightforward information that every team should be asking for before starting a project yet sometimes overlook. It’s something that could apply to any kind of product development, not just agile and not just software, which made the talk especially interesting. The theme of the talk was basically to ask the big questions as early as you can to clarify intent, clarify understanding and goals and to identify and manage risk. Going through the deck is something he recommends to teams that he’s worked with. It can take a couple days or a couple of weeks for teams to get through. Be clear on what’s going to give. Show what it’s going to take. The last hour of this session was a team exercise where we split into groups for each table. For a fictional company and a fictional product, we went through the the inception deck and step-by-step focused in on what would (and wouldn’t) be our end product. 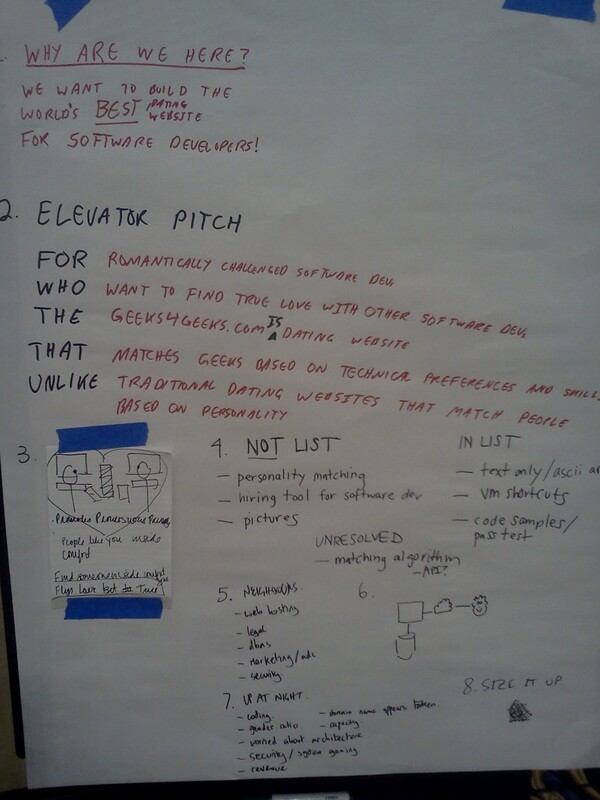 Jonathan had example products to choose from: next generation television, a mobile application or a dating website. Our group chose the dating website and got a little creative. Geeks4geeks.com was the name we chose. From the name, you may already have guessed our intended customer base. Here’s a picture of what we came up with from the inception deck questions. Not being a software developer, I was OK with how things were shaping up :). To sum this session up, one fellow offered his assessment as “it’s 4:45, I’m not asleep and I’m actually pretty excited”. Pretty spot on. It was a great session and would have been tough to sleep through! If you’re interested in the agile inception deck, Jonathan has a blog post that goes into detail for each step. My first ah-ha moment came while Jonathan lead discussion around step 3 of 10. Agile teams talk so much about value and understanding customer need. In hardware development, however, I think it’s fair to say we don’t generally see that same kind of fascination across the entire development team. The work is being done by somebody, obviously, but surely we could benefit from more inclusive debate around questions like Why are we here and creating an elevator pitch, no? The answers would be different but value is value and I can’t help but think we should be talking more about it. Maybe this inception deck would be useful for getting those discussion started? Tomorrow at 11am is my talk TDD And A New Paradigm For Hardware Verification. Just a few final touches, a quick once over tonight and it should be ready to go! That’s all for today. Much more to come in the next few days!